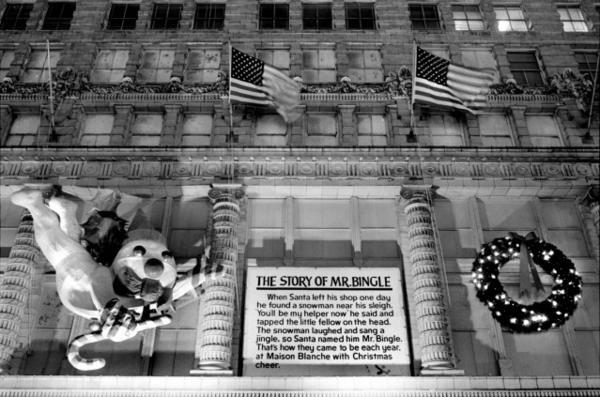 Photograph of Christmas character, Mr. Bingle, and a sign on Maison Blanche department store. Images of New Orleans: The Donn Young Photograph Collection, Louisiana Digital Library, Baton Rouge, La. Mr. Bingle made his debut in the Maison Blanche department store windows on canal street during the 1948 Christmas season. The concept came from Emile Alline Sropens a new window., the display director for Maison Blanche, who pitched the mascot as a "snowdoll." The idea was brought to life by puppeteer Edwin "Oscar" Isentroutopens a new window. Mr. Bingle was a snow man with an ice cream cone hat and holly wings. Mr. Bingle's name was chosen by Maison Blanche President Lewis Schwartz Jr. after a failed contest when none of the shopper submissions were deemed appropriate. Mr. Bingle was featured in marionette shows in the department store windows throughout the holiday season. Often Mr. Bingle would get into trouble, and Santa would have to get him out of it. The shows were so popular that according to a 1949 Times Picayuneopens a new window article, "Two uniformed men were required to help get adults aside so children could see the Bingle show" on Canal Street. In 1949 Maison Blanche began manufacturing plush Mr. Bingle's for purchase and installed a giant 50 by 35 foot figure on the exterior of its flagship store. The figure was built in Chicago and it took two train cars to transport the giant Mr. Bingle to New Orleans. Eventually Mr. Bingle would also appear in his own televised holiday specials. Maison Blanche closed in 1998 and the Canal Street store is now the Ritz Carlton Hotel. However, Mr. Bingle lives on as part of City Park's annual Celebration in the Oaksopens a new window light display and in a line of seasonal merchandise available from Dillard's. The original Mr. Bingle puppet has survived as well. Isentrout, the original puppetter, passed away in 1985 and was buried in an unmarked grave, but the proceeds from Sean Doles novella Saving Mr. Bingle were used to construct a marker, which includes a sketch of Mr. Bingle. 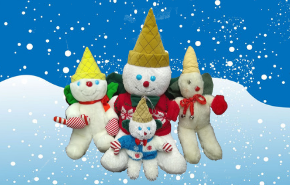 At that point one of the Mr. Bingle puppets was given to one of Isentrout's protege's Jeff Kent. Kent kept Mr. Bingle in a closet in his home in New Orleans. During Hurricane Katrina, the home took on ten feet of water, and Mr. Bingle sat in sea water for more than a month. Kent was able to restore the puppet. To learn more about holiday traditions in New Orleans, check out Christmas in New Orleans. To learn more about Maison Blanche and the family that owned the store, read We Were Merchants or Maison Blanche Department Stores.